Camping MITHIMNA recommends some of the most important sights in Crete that are worth visiting so that you can enjoy the drive around our beautiful island! The Venetian port is picturesque at any time of the season. Its beauty and choices in entertainment attract both visitors and the locals and it caters for everyone’s tastes and demands. The districts in the old city "within the walls" have preserved their Venetian nobility. The narrow cobblestone streets are surrounded by tastefully restored houses from various ages and are ideal for a leisurely stroll. 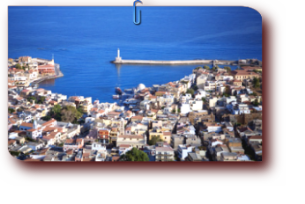 Many neoclassic houses have also survived in districts such as Halepa that are "adjacent" to the city of Chania. 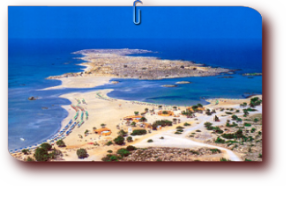 Falasarna beach is the most western part of Crete and is located in its namesake town. It is accessible by car and has become famous for its crystal clear waters and its unspoiled beauty. It is quiet and very romantic and not tourist oriented. It is worth a visit to relax in the beautiful unspoilt landscape and to enjoy perhaps the most glorious sunset on Crete! You will find it on the most western part of the island and it is an extremely idyllic beach. It is quite a popular exotic location that is worth visiting! The best way to get there is by a day trip with a cruise ship. Daily services are available from Kissamo port. Balos is very popular with visitors over summer, so it is worth going for a dip in its enchanting waters! 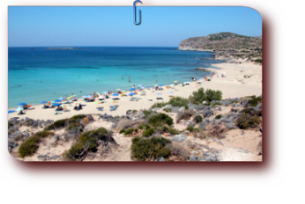 Elafonisi is perhaps the most popular beach on all of Crete and is situated at its south west section. 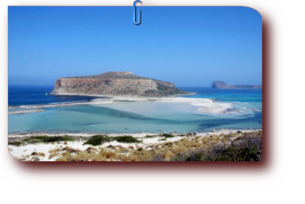 You can visit it by boat from Paleochora or by road driving south west from Chania. It is a paradise on earth with its white – pink coloured sand and turquoise waters. It is perhaps the most cosmopolitan beach in the prefecture and is always full of people of all ages over the summer months.